: People are not born equal, a realization that 4-year-old Midoriya Izuku faced when bullied by his classmates who had unique special powers. Izuku was one of the rare cases where he was born with absolutely no unique powers. This did not stop Izuku from pursuing his dream, a dream of becoming a great hero like the legendary All-Might. To become the great hero he hopelessly wants to become, he now will join the ranks of one of the highest rated "Hero Academies" in the country: UA. 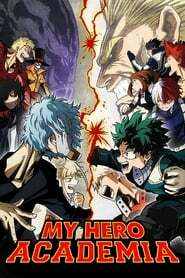 With the help of his idol All-Might, will he be able to claim the ranks and become a true hero? Episode 5 : Drive It Home, Iron Fist!!! Episode 7 : What a Twist! Episode 20 : Special Episode: Save the World with Love! Episode 21 : What's the Big Idea?